Thompson Rivers University plans to prohibit the recreational use of cannabis on campus. This, despite the failure of prohibition to deter use for the last 95 years in Canada. Cannabis is not harmless. Inhaling smoke, be it from wildfires, tobacco, or cannabis carries risks. But banning cannabis is not the way to control those risks. Education is. Education has reduced the consumption of tobacco. Reductions have been especially greater for those with a higher education according to a report from Statistics Canada. TRU has nine designated locations where tobacco and medical marijuana can be smoked. Once cannabis is legalized on October 17, those locations would be a logical place for recreational cannabis smokers as well. But they were apparently swayed by arguments presented by Montoya: cannabis is more potent than ever before, bystanders can get stoned from second-hand smoke, and marijuana has been linked with psychoses. “There have been a series of studies in which non-smokers are shut into a small room with cannabis smokers and tested for both impairment and positive urine tests. While these things can happen, it is only under the most extreme circumstances,” he told me by message. “Researchers at John Hopkins University have been conducting studies on the effects of cannabis smoke exposure to non-users and have found that, under regular indoor conditions, non-smokers did not experience changes in cognitive ability –i.e. ’get high,’” says Michelle Thiessen in a letter to KTW. Failing to have a “place for cannabis” perpetuates the notion that prohibition will reduce cannabis use. Banning cannabis has a predictable effect -it simply drives consumption into the shadows and prevents dealing with the risks. Prohibition is futile: TRU might as well prohibit wildfires -it would be as effective. 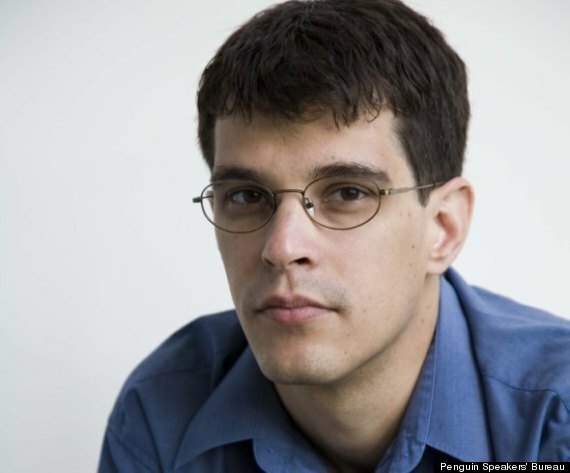 Award-winning Kamloops author Steven Galloway has problems of his own making. They could have been avoided. Galloway was raised in Kamloops and attended the University College of the Cariboo in the 1990s before it became Thompson Rivers University; where I taught for twenty years. Galloway is best known for his 2008 novel The Cellist of Sarajevo which sold 700,000 copies, was translated into twenty languages, and had film options. His career took off and he became chair of the creative writing program at the University of British Columbia on July 1, 2015. Former students don’t see it that way. They say he fostered a sexualized atmosphere, drank regularly with students and played favourites –bringing some students into his inner circle while casting others out. Reporter Kerry Gold investigated some of those misadventures in her feature-length article in The Walrus (December, 2016). Galloway would convene Thursday-night sessions in a local canteen known as the Legion with up to ten students. “The group would stay late, consuming alcohol at a pace that made some uncomfortable,” says Gold. Galloway’s former teaching assistant, Erin Flegg, says the sessions became an informal part of the curriculum. Participants would vie for Galloway’s approval and the rewards it could bring: references, teaching positions, introductions to agents and publishers. One night in 2012 was particularly rowdy when they met after graduation. It wasn’t late but Galloway had quite a lot to drink, a witness told Gold. “It’s time,” Galloway said, as he got up and slapped the face of a female student next to him. It was revenge for what she had said in class –that she didn’t like Galloway’s writing. Galloway then responded that he would like to slap her face but that he would wait until she was no longer a student. Partying with students is a bad idea. As a high school teacher and later an instructor at TRU, my policy was never to date or revel with students. The obvious problem is the power differential. Teachers have the power to promote students and advance their careers. Another student hoped to get into Galloway’s writing class and was drawn into to the struggle for his attention. “He invited her to come drinking,” says Flegg, “That’s how the relationship began. The power dynamics were there from the start.” The two had a relationship for three years. Intimate relationships are a temptation for teachers. For me, I only had to remind myself that I had been placed in a position of trust: the betrayal of which would diminish me and my profession, and would harm my students. 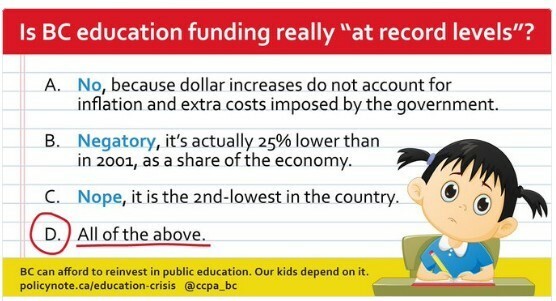 The BC Liberals claim in a fact sheet that spending on education is at record levels. A reality-check shows otherwise. Sure, spending is up if you consider only dollar amounts. When inflation is factored in, a different outcome emerges: there is no increase at all. Spending is not at record levels and spending per student is dismal. Compared to the rest of Canada. B.C. is second last with PEI at the bottom. Alberta is second highest with Manitoba at the top. However, Premier Clark can truthfully boast about record spending in one area. Funding for private schools has increased at more three times the rate of public schools over the past ten years, and is now projected to reach $358 million in the 2016/17 school year. She is mistaken in the belief that private schools are better. Student performance is affected by their parents’ socioeconomic status. 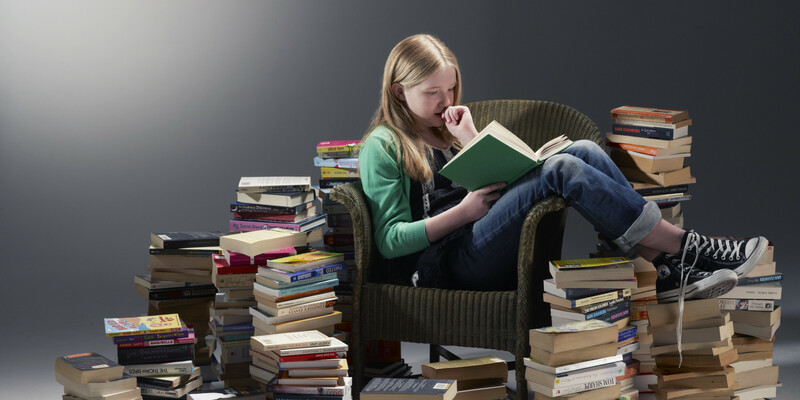 In a study by Statistics Canada and reported by the CBC, the success of students is a result of resources at home. “For example, compared with public school students, higher percentages of private school students lived in two-parent families with both biological parents; their total parental income was higher; and they tended to live in homes with more books and computers,” the report says. At first glance, the plan to close underutilized schools seems perfectly rational until you consider the details. They count computer labs, art and music rooms, as “empty” because they are shared by all students. By this warped calculation, a school with seventeen full classrooms and three “empty” rooms would be only 85 per cent full. Despite all the perky talk about how great Clark’s government is doing, the real agenda of the BC Liberals is clear: keep spending on public schools low and ensure that private schools are available to the deserving rich. Immigrants are not getting a whole story of the way our government works. They are given a study booklet called Discover Canada, the Rights and Responsibilities of Citizenship in preparation for becoming citizens. The booklet describes the traditional branches of government but fails to mention one of the most powerful agencies of government, the Prime Minister’s Office. It’s not even mentioned in our statutes or constitution. The rise in power of the PMO can rightfully be labeled a coup. For your enlightenment, future citizens of Canada, here’s what the government’s booklet is not telling you. The Prime Minister’s Office is not a spot where the prime minister has an office. Rather it is a powerful agency staffed by approximately 100 people from the prime minister’s party. They are loyal to the prime minister alone, certainly not to elected members of parliament and not even to minsters of state. The PMO does the bidding of the prime minster, to shape the PM’s public image and to tell ministers of government what to say and do. This is the opposite to what you are told in the booklet which suggests that ministers of government advise the prime minister on important matters. Like members of the senate, members of the PMO are not elected. Unlike members of the senate, they do not represent regions of Canada, do not necessarily have any experience in business or politics, and are not even a mix of appointees from past and present governments. You will rarely hear such candid remarks from members of the government because, you see, the prime minister will fire them if they get out of line. It’s the kind of fear you would expect from an employer/employee relationship but it’s no way to run a government. The prime minister should take direction from his party and parliamentarians. The PMO has become so powerful that it can act without even the knowledge and approval of the prime minister. The extent of this power was revealed through the release of emails in the investigation of alleged bribery by Senator Duffy. It turns out that many members of the PMO knew about the payoff to the senator but not the prime minister. Even the prime minister’s close friend and chief of staff knew and never told the PM. This is only one case that we know of where the PMO acted independently of the prime minister. It’s a dangerous subversion of parliamentary democracy. There may be others. The growing power of the PMO illustrates how unelected agencies can wield power and run out of control of their supposed masters. 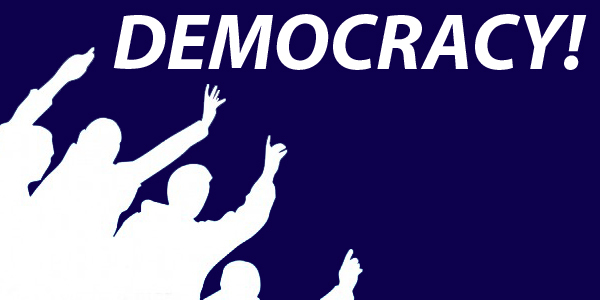 Strive to restore democracy to Canada, future citizens! Restore integrity to our democratic institutions. History: what is it good for? The past seems mysterious. Noble savages appear as apparitions out of the mist. Prairie schooners drift across the cloud-strewn horizon buoyed by waves of grass. Or, maybe not. Maybe the past is ancient history: over and done with. Get on with life. History is a bore. That’s how some students in Professor Tina Loo’s UBC class feel. Their comments are hardly uplifting. “Professor Loo tries hard, but what can you do with Canadian history” and “Wake me when it’s over.” The end of history can’t come soon enough for them. What do we want from history? “A lot, as it turns out,” says a weary Loo in Canada’s History magazine. A safe point of agreement is that dry facts are ancient history. At one time the recital of dates was used to test history. Now they are no more history than arithmetic is part of mathematics. “The Dominion of Canada was formed on July 1, 1867,” may be true but without the context of our territory being swallowed by the U.S. the fact is meaningless. We expect history to be a teacher. If we don’t learn from history, the saying goes, we are doomed to repeat it. Without any real evidence to back the claim, the past can apparently predict the future. True, current events may have echoes in the past but do they predict the future? Stock market investors sure hope so. “Or it’s a judge,” offers Loo. Is Stephen Harper the greatest prime minister that Canada ever had? History will be the judge. History as judge evaluates the legacy of leaders in the context of a larger narrative. History, like hindsight, is 20/20. History is reconciliation. Canada’s Truth and Reconciliation commission has wrapped up after touring the country for 4 years, listening to stories of cruelty and abuse at the hands of those entrusted with their care. The effect has been cathartic. “A lot of people got healed just by telling their story,” said 80 year old Vicki Crowchild of the Tsuu T’ina Nation, just outside of Calgary. We want history to tell us who “we” are. Canadian identity is shaped by historical events. The struggle of the prairie populist Tommy Douglas to bring universal health care is a story we take pride in telling. We want to be amused. “Finally, and not least, we consume history –literally as heritage foods, and figuratively, as entertainment, whether in the form of documentary films, historic sites, or museum exhibits,” says Loo. While we may want history to teach and judge, are we prepared for the lessons and judgments that history offers? What we find might not be flattering such as the settler colonialism that stole the land of indigenous people, or the racist policies that ended in Japanese internment camps, or discriminatory Chinese head taxes.